It's not very often that we get to design and create wedding stationery like this! These were designed for my Swami's son who wanted something different but kept in line with the spiritual philosophy of the ashram. Two different invitations were required: one for local guests and one for Sri Lankan guests. To add a feel of antiquity to the invites we used a distressed background, bordered in a mehndi pattern and mounted onto a piece of brown kraft board. The final touch was a hand-made gold clay Tamil Om seal (made by us and which could be removed from the invitation as a memento), placed over an orange ribbon strip to represent the ochre robes of the sadhu. The 250 invites were enclosed in simple brown manilla envelopes. 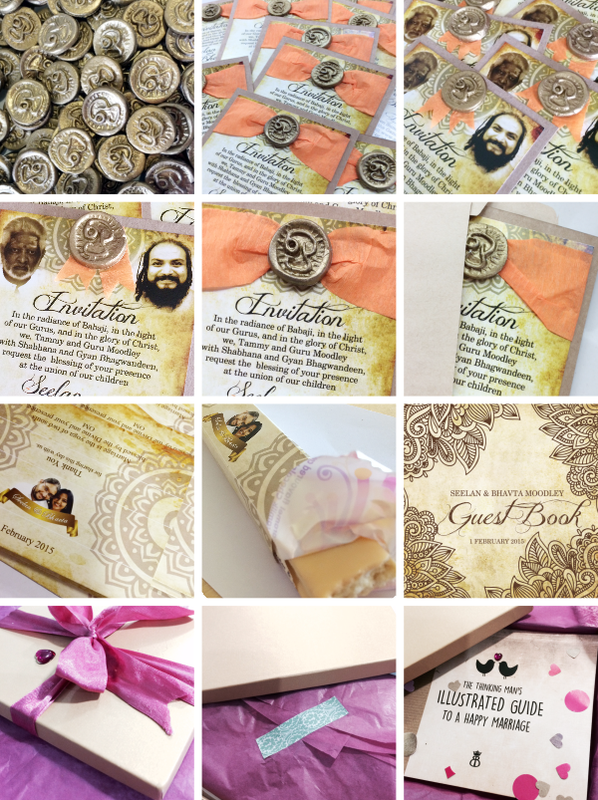 Other components we produced for the grand occasion included 500 'thank you' chocolate sleeves, a custom designed guest book cover, and a unique booklet, "The thinking man's illustrated guide to a happy marriage", written by the bride-to-be as a gift to her new husband. This was printed in the same antiquated style as the invites but with a modern twist, and carefully packed with some coloured funfetti into a gold box tied closed with a cerise ribbon. As you can imagine, this project stretched over a few months but it has most definitely been one of our most favourite of 2014/15!